Phase-folded light curves of LP415-17 corresponding to planets b (top), c (middle), and d (bottom). Credit: Alonso et al., 2018. Using NASA's prolonged Kepler mission, known as K2, astronomers have found three new "super-Earth" exoplanets. The newly detected alien worlds orbit the cool dwarf star designated LP415-17. The finding is reported January 18 in a paper published on the arXiv pre-print server. Kepler has discovered more than 2,300 exoplanets to date. Although the spacecraft lost its two reaction wheels in 2013, it was repurposed as K2 to perform high-precision photometry of selected fields in the ecliptic. Since then, the revived Kepler telescope has found nearly 200 extrasolar worlds. Now, a team of researchers led by Enrique Diez Alonso of the University of Oviedo, Spain, reports the finding of three new exoplanets from the data acquired by the K2 mission. The Kepler spacecraft observed the star LP415-17 between March and May 2017, during its Campaign 13. These observations allowed the team to discover that this star is orbited by three exoworlds. The newly detected planets were classified as super-Earths, as they have masses higher than Earth's but lower than that of solar system's gas giants. 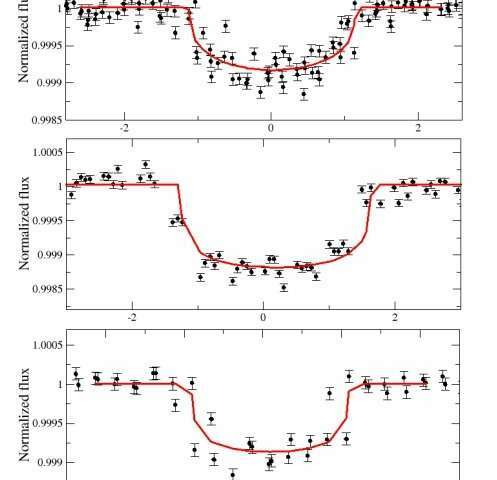 "We present the detection of three super-Earths transiting the cool star LP415-17, monitored by K2 mission in its 13th campaign," the researchers wrote in the paper. Located some 267 light years away from the Earth, LP415-17 is a star of spectral type K with a radius of about 0.58 solar radii and approximately 35 less massive than our sun. It has an effective temperature of 4,258 K and was therefore classified as a cool dwarf. Alonso's team identified a transit signal in the light curve of LP415-17. The planetary nature of this signal was later confirmed by follow-up observations with the WIYN 3.5-Meter Telescope at Kitt Peak National Observatory in Arizona. According to the study, LP415-17 b, with a radius of about 1.8 Earth radii, is the smallest planet of the newly discovered trio. It has a mass of 4.7 Earth masses and orbits its parent star every 6.34 days at a distance of 0.056 AU from the host. The planet has an equilibrium temperature of 708 K.
LP415-17 c is the largest and most massive planet in the system – it is 6.5 times as massive as the Earth and has a radius of approximately 2.6 Earth radii. At a distance of nearly 0.1 AU from the host, it has an equilibrium temperature of 583 K and an orbital period of 13.85 days. LP415-17 d has a radius of 1.9 Earth radii and is almost five times as massive as our planet. The exoworld has a semi-major axis of about 0.19 AU and it takes it 40.7 days to fully orbit its host star. The planet's equilibrium temperature is 381 K.
The researchers concluded that the newly confirmed planets could advance our understanding of formation and dynamical evolution of super-Earth systems in the rocky – gaseous threshold. LP415-17 and its planets could provide important hints about the nature of such systems, including their atmospheres and composition. We present the detection of three super-Earths transiting the cool star LP415-17, monitored by K2 mission in its 13th campaign. High resolution spectra obtained with HARPS-N/TNG showed that the star is a mid-late K dwarf. Using spectral synthesis models we infer its effective temperature, surface gravity and metallicity and subse- quently determined from evolutionary models a stellar radius of 0.58 R Sun. The planets have radii of 1.8, 2.6 and 1.9 R Earth and orbital periods of 6.34, 13.85 and 40.72 days. High resolution images discard any significant contamination by an intervening star in the line of sight. The orbit of the furthest planet has radius of 0.18 AU, close to the inner edge of the habitable zone. The system is suitable to improve our understanding of formation and dynamical evolution of super-Earth systems in the rocky - gaseous threshold, their atmospheres, internal structure, composition and interactions with host stars. MT, I agree with your comments. I resent the manipulation with clickbait headlines. I understand the need to gain a high count of eyeballs to keep the advertisers happy to pay for their slots. They are paying for all this glorification of 'Progress". Also, it concerns me this use of really stupid terms such as "Super-Earth" and "Alien Bacteria". Nothing 'super' about any of these newly discovered planets. As you pointed out MT, 'pressure-cooker' is the least of the problems comparing these planets to Earth. How about using a term such as 'Ogre' or 'Behemoth'? Designating a newly discovered alien life (when multi-verified Proven NOT to be of Earth life) with the term such as 'bacteria'. Will result in errors confusing the role that bacteria play in the Earth's biosphere. With the role an alien organism may play in it's native alien biosphere. I know you all want quick, simplistic answers. The universe is a chaotic mess. Get over it! The criticism of click-bait title has some merit. That said, there is still room for an Earth-sized planet farther out where the 'Goldilocks zone' would be. Perhaps it doesn't transit. TB, what if they do not find any such earth-similar world? That does not mean that I am correct in my belief that we will not find any living worlds. Or at least, not without major leaps forward from our present and foreseeable technology. It does not mean that you are wrong in your belief that there must be Earth-Similar Planets or at least Living Worlds, yet to be discovered. There just isn't any evidence to prove or disapprove our speculations.